This 2018 Easter toll is the equivalent of 4 large planes crashing over 12 days. Plane crashes would have received immediate media and parliamentary coverage and action. Why are people not outraged and demanding evidence-based actions? This is absolute carnage and the cost of the deaths alone is R2 Billion over this period. This does not take into account all the costs of the injured, costs of vehicle repairs or other incidents costs. These crashes retard our long term economic growth and push families into poverty. We need greater best-practice prevention action. Behaviour only changes if there is a high probability of being caught and receiving penalties. In South Africa people drive dangerously because they can get away with it. This causes carnage. 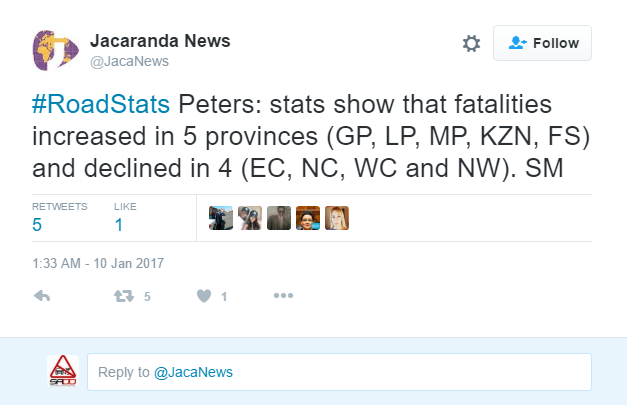 South Africa has some of the worst road traffic injury statistics in the world. Each year, millions of people are killed or injured on our roads. These are people who are loved and missed by their families and the impact of the crash will touch hundreds of people and affect many lives. It also impacts on the South African economy and so these lives are not just statistics. SADD would like to extend their deepest condolences to the all the families and friends that have lost their loved ones due to road crashes. South Africans Against Drunk Driving (SADD) are extremely concerned at the 5% increase in the death rate this holiday season. Approximately 1 714 people have died, which is the equivalent of 5 airplanes. This on top of the 15% increase last year means we have had a 20% increase in 2 years. Alcohol abuse is behind at least 65% of these incidents, with 5943 of 9175 drives being charged with drunk driving. Department of Transport say they are committed under the UN’s “Decade of Action” to get road deaths down by 50% by 2010. Deaths can only be confirmed 30 days after the crashed happen. Statistics are not so accurate in SA as the crash may have occurred and captured in a rural area, and the patient taken to an urban Hospital, where he then dies. SAPS from rural areas are unlikely to follow up and record that death. So our deaths and injuries are very under reported. The Department of Transport reports 1714 people died this holiday season, so far. 1 714 people is the equivalent of 5 airplanes crashing over the holiday period. 5 planes!! 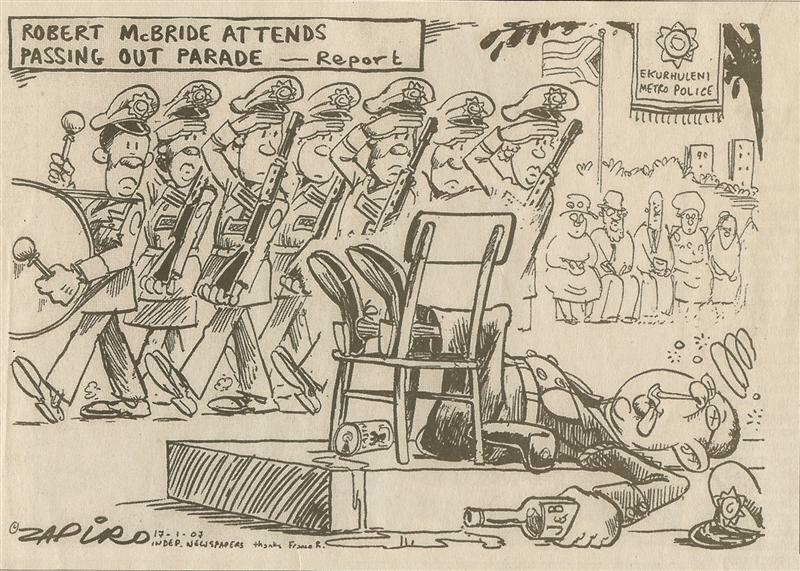 Alcohol abuse is behind at least 65% of the incidents. This is just totally unacceptable. The main reason it is unacceptable is that many of these deaths (and the injuries which they have not reported) are preventable if the Department followed the best practice measures that are adopted by countries that have dramatically reduced their crashes like UK, Australia, Sweden, etc. SADD asks every one to get involved to demand safer roads,and fight with us to demand the Governement takes urgent and appropriate action now. There should be a month of mourning for these people,and an inquiry into the competence of our transport department to deal with the crisis. Minister Dipuo Peters highlighted that the festive road fatalities have increased by 14%. 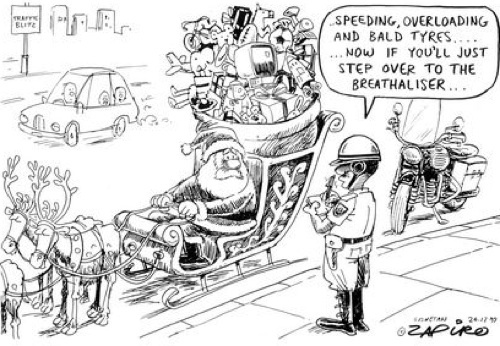 Between 1 December 2015 and 11 January 2016 there were 1755 fatalities on South African roads, which indicates an increase of 220 deaths from the 1535 deaths in the 2014/2015 festive period. SADD would like to extend their deepest condolences to the 1755 families who lost their loved ones on the road. The Western Cape was recorded as being the province with the highest level of death due to road crashes, as they had an increase of 33% from last year. KwaZulu Natal, according to Minister Peters is the only province in the country to report a decrease in holiday deaths. The 2015 WHO Global Status Report on Road Safety shows that while some improvements have been made in South Africa’s road safety, there remains a signficant level of improvement needed. South Africa’s reported road fatalities per 100 000 is 25.1, which is 23rd out of the 50 African countries included in the Report. Enforcement levels were similar to the 2013 Report. South Africa continues its poor enforcement record. SADD urges the Department of Transport and Department of Justice to implement stricter enforcement of South Africa’s road safety laws. Without enforcement, the laws are meaningless. The Report estimates that 7,8% of South Africa’s GDP is lost due to road traffic crashes. This lost revenue could be used to address South Africa’s other social issues, such as the recently much reported lack of funding for tertiary students. Of interest and deep concern SADD points out that in these terrible 2 weeks of violence in April 2015 when 7 foreigners were killed, that 56 children and about 600 adults would have died on South African roads. Many others would have been injured or paralyzed. This is preventable road carnage. Changing seat belt enforcement from a poor 1/10 and drink driving enforcement from a poor 2/10 to a much higher rate, with swift prosecution and appropriate sentences or fines would assist to bring down deaths and injuries dramatically. 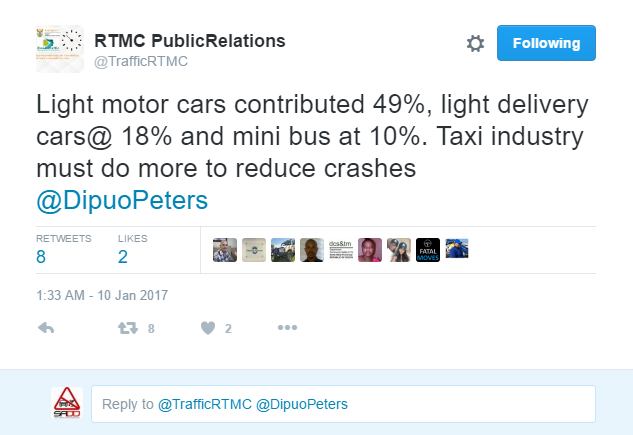 On the 9th of January 2015, Minister Dipuo Peters announced that there were 1,118 fatal road accidents recorded between December 1 and January 5 and 1,368 fatalities. She said this reflected a decline in the number of fatalities. However, last year the period reported continued until the 7th of January 2014, thus adding an extra two days and rendering a comparision insignificant. 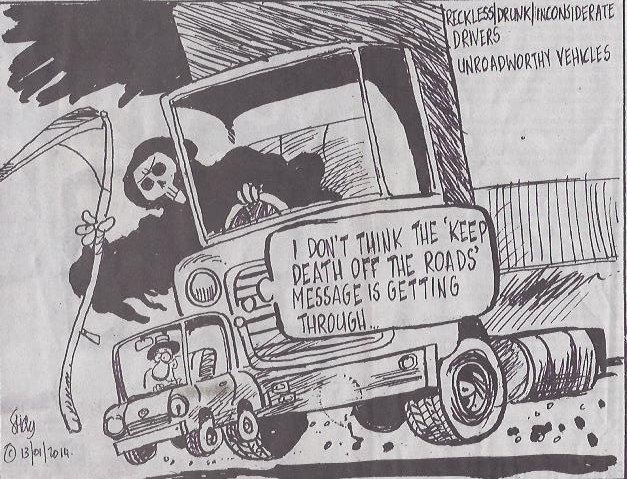 Road traffic incidents remain a important problem in South Africa. SADD makes the following recemmendations to government. We also send our condolences to the 1,368 (or more) families who lost loved one’s on our roads over the past festive season. These 1,368 people are not just nameless statistics or numbers. These are real people – mothers, fathers, brothers, sisters, uncles and friends. Pillars of our society and breadwinners. We tend to forget the 20 – 30 who are injured for every person who dies and 25 are paralyzed daily. SADD work with the United Nations and World Health Organization (WHO) and they have asked us to highlight the cost of injuries. Of the estimated 59 935 injury deaths in 2000, 46% (27 563) were homicides. Road traffic and self-inflicted injuries accounted for 26.7% and 9.1% of the injury mortality, respectively (see the table below). 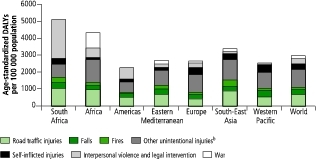 Homicide was the leading cause of fatal injury in males; road traffic injuries ranked second. This order was reversed in females (see the table below). Worldwide, road traffic injuries are responsible for the highest injury mortality.5 In South Africa, road traffic injuries ranked second to interpersonal violence but the road traffic fatality rate (39.7 per 100 000) was higher than for any WHO region and almost double the global average.28 Unlike the global pattern, these accounted for a higher proportion of female (32.6%) than male deaths (24.8%) as the exceedingly high number of male interpersonal violence-related injuries reduced the relative proportion of road traffic injuries. This high burden is caused by unsafe road environments, poor enforcement of existing traffic laws, road rage and aggressive driving. Alcohol misuse appears to be a major contributor. A recent study in the United States of America showed that the incidence of alcohol-related mortality in motor vehicle crashes was lower during periods when zero tolerance and administrative licence revocation laws were in effect. In South Africa, legislation sets drivers’ maximum blood alcohol concentration at the internationally acceptable level of 0.05 g/100 ml, yet almost half (46.5%) of all drivers killed in motor vehicle collisions were above this legal limit. Pedestrians are involved in more than half (52%) of road traffic fatalities. Although alcohol plays a major role in pedestrian injuries, equal attention should be given to safe and convenient crossing points, good lighting and the use of reflective clothing. Lack of adult supervision is an important contributing factor in child pedestrian injuries, highlighting the need to include adults in road safety education and awareness campaigns. Strong political will is key to prevention efforts; a directorate for injury prevention could perhaps be established within the national Department of Health. However, it is important to investigate the appropriateness of injury prevention strategies, as those that are successful in high-income countries may not work in low- and middle-income countries. It is also important to develop and evaluate strategies adapted to cultural, social and economic realities. In South Africa, this can be achieved by building capacity in the injury prevention and control field of behavioural and social science research, as suggested by Gielen and Sleet. 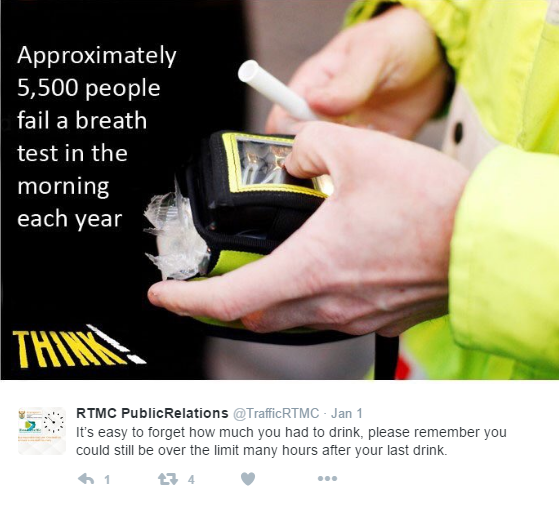 More random alcohol testing – morning, noon and night- 24 hrs-every day of the week- all yr- and not just at holiday periods. The establishment of “Drink Driving Courts” so drink drivers are tried and sentenced within 1 month of the incident. All convicted drink drivers to automatically have licence removal and be sent for alcohol education and/or treament with properly trained addiction counsellors. Every driver to be tested for alcohol or drugs at every crash scene, and for all SAPS and Traffic Police to have screening breathalyzers in their vehicles. Traffic Officers to be on duty- 24/7,and especially at night and weekends when most crashes happen. “Accidents” to be called “crashes”- as per the UN’s recommendation- because they happen for a reason eg drink driving/speed/unsafe overtaking/unroadworthy cars, so it is not just an “accident” they happen. In South Africa, deaths per 100,000 = 43 This is shocking! On a daily basis, 45 people die and 410 are injured, with 25 people becoming paralyzed. According to the National Injury Mortality Surveillance System (NIMSS) of 2010 SA’s annual road traffic fatality burden is estimated in the region of 18 000, with road traffic deaths of 43 per 100,000 (UK: 6 per 100 000, Australia: 8 per 100 000, USA: 14 per 100 000 – according to WHO.) CSIR says road crashes costs SA R309 Billion annually. 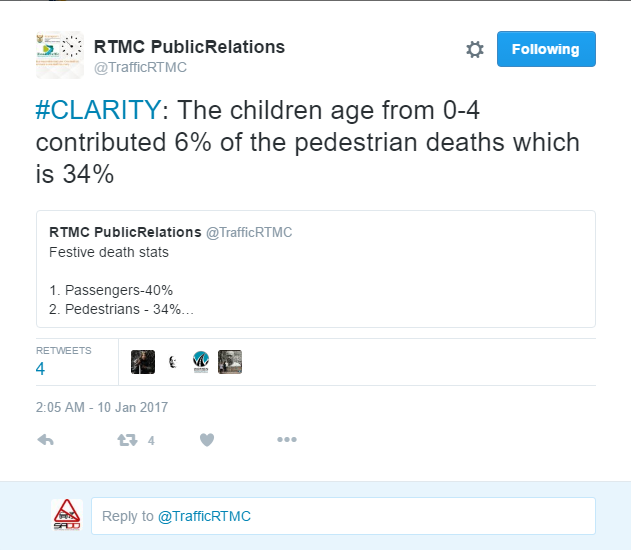 DoT still loosely talk about approximately 14 000 deaths a year- but most people involved with road safety feel these are largely incorrect and the crashes/deaths and injuries are underreported. Alcohol abuse (drinking then driving/walking) causes half of these problems.